New Delhi, Sep 6 (IANS) India on Thursday called upon the US to ensure a non-discriminatory and predictable approach to issuance of H-1B visas, largely availed of by Indian IT firms. “I sought Secretary Pompeo’s support to nurture our people-to-people links,” External Affairs Minister Sushma Swaraj said while addressing the media after participating in the first ever 2+2 India-US Ministerial Dialogue along with Defence Minister Nirmala Sitharaman, US Secretary of State Mike Pompeo and Defense Secretary Jim Mattis. “Specifically, I conveyed our expectation for a non-discriminatory and predictable approach to the H-1B visa regime, given its high impact on innovation, competitiveness and people-to-people partnership, all of which are a vital source of strength for our relationship,” Sushma Swaraj said. In February, the US President Donald Trump came up with a new visa policy that makes the procedure for issuing H-1B visas tougher. According to the new policy, the hiring company would have to prove that its H-1B employee at a third-party worksite has specific and non-qualifying speculative assignments in speciality occupation. 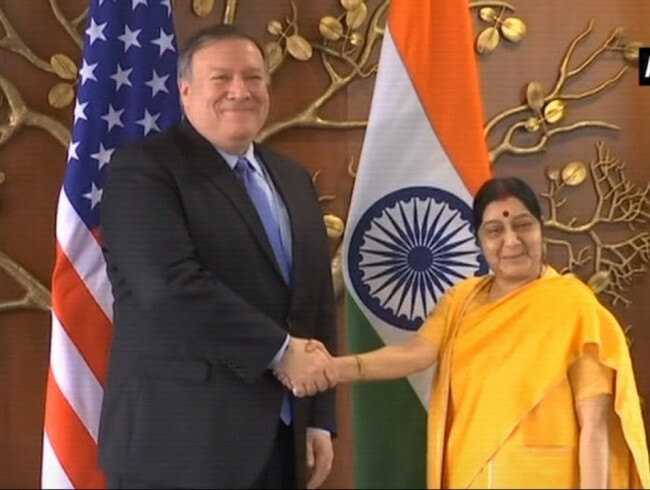 Sushma Swaraj said she mentioned to Pompeo that on the basis of the friendship between Trump and Prime Minister Narendra Modi, Indians believe that the US will not work against their interest. “I have mentioned to him to maintain the trust of Indians,” she said.